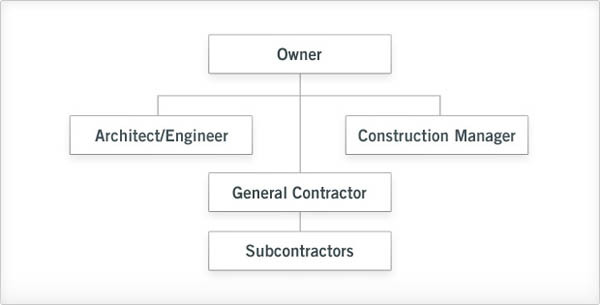 In the form of construction management known as agency, the owner selects a construction manager, as well as an architectural firm, who then work together as a team to advise, coordinate, and inspect during project design and construction. Contractors are selected through hard, select, or negotiated bids. Typically, owners pay construction management firms a fee to act as their agents or advisors for a construction project. The construction management firm guides in the evaluation and selection of a general contractor or subcontractors, as well as advising on the construction process, feasibility, and possible cost and time savings through value engineering and other analysis. If a general contractor is hired, the owner signs an agreement directly with the general contractor. If no general contractor is retained, then the owner contracts directly with subcontractors. The construction management firm provides input on cost during the design phase, allowing stakeholders to evaluate the cost of various designs during conceptual development. Because people are working as a team, professional services fees tend can be more effectively managed and determined early in the process. Professional services include architectural and engineering fees, contractor fees, and legal fees. Construction costs are minimized, thanks to the construction manager’s input on the effectiveness of the means, methods and techniques to be employed during construction. If the owner contracts directly with the trade contractors, then the owner saves the fees and markup associated with the general contractor. The fee for the construction management firm is clear and determined early in the process. Fast tracking and a reduced schedule are possible, because construction activities can begin before all aspects of the design are completed. Project completion dates are realistic and less likely to be delayed. The owner can benefit from special services: feasibility study, life-cycle cost analysis, and value engineering. Stakeholders in the process work together as a team to complete design and construction for the benefit of the owner. Stakeholders produce better results thanks to the team approach to completing the project.